The Rhode Island Geography Education Alliance will have two separate meetings at the end of this month to help chart the future of the Geography Education in the Ocean State. I hope you consider attending the one that fits you best. This first-of-its-kind meeting brings Rhode Island professional users of GIS and geo-tech together with teachers using the same technology in the classroom. 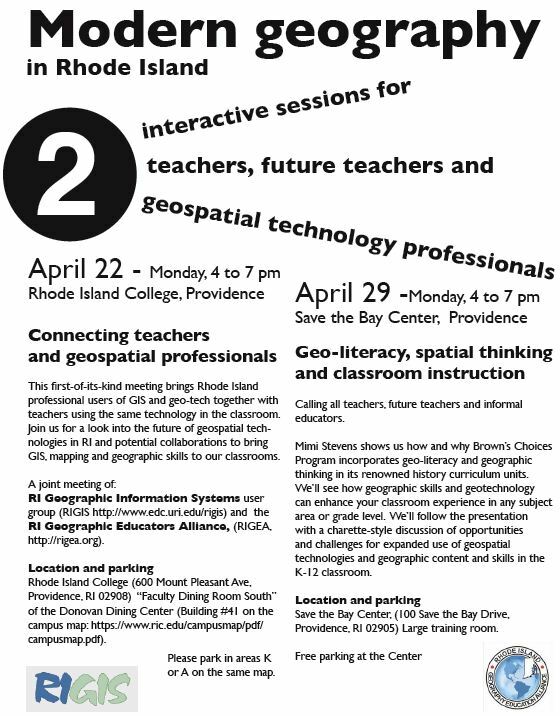 Join us for a look into the future of geospatial technologies in RI and potential collaborations to bring GIS, mapping and geographic skills to our classrooms. This will be a joint meeting of RI Geographic Information Systems user group (RIGIS ) and the RI Geographic Educators Alliance (RIGEA). Location and parking: Rhode Island College (600 Mount Pleasant Ave, Providence, RI 02908) “Faculty Dining Room South” of the Donovan Dining Center (Building #41 on the campus map). Mimi Stevens shows us how and why Brown’s Choices Program incorporates geo-literacy and geographic thinking in its renowned history curriculum units. We’ll see how geographic skills can enhance your classroom experience in any subject area or grade level. We’ll follow the presentation with a charette-style discussion of opportunities and challenges for expanded use of geospatial technologies and geographic content and skills in the K-12 classroom. Save the Bay Center, (100 Save the Bay Drive, Providence, RI 02905) Large training room.